Chocolate-walnut tortes, hazelnut macaroons, almond maronchinos and marzipan. For many of us, Passover without nuts would be well, nuts. Eight days of unmitigated matzo - whether whole, crushed or ground - could overwhelm even the most creative Jewish cook. So along with too many boxes of matzo, I overload the grocery cart with a remarkable quantity and variety of whole and ground nuts. But when the Seders are over, I can't bring myself to do much more baking - after all the matzo balls, I don't really have the heart - or stomach - for making lots of desserts. The nuts won't go to waste, though. Truth is, they are just as delicious in savory Passover recipes and have the added inducements of being gluten-free and loaded with healthy fats. And unlike matzo, nuts still taste like a treat. That's a tradition that goes way back. Before Jews ever celebrated a Seder, Jacob sent a thank you gift that included both almonds and pistachios to Pharaoh's governor (who, unbeknownst to him was none other than his own son, Joseph, of the Technicolor coat). A few hints to begin: nuts are infinitely more flavorful when you toast them lightly first. If you're not planning to use them for a while, toast, then let them cool, and store tightly wrapped in the freezer; because of their high oil content, they go rancid quickly. For that reason, always taste one before using in a recipe to check for off flavors. To chop nuts in a blender or food processor, chop no more than one cup at a time, processing with quick, on/off pulses. 1. Add interest to ground meat. Michael Solomonov, author of the fabulous cookbook, Zahav, likes to mix pistachios into ground meat for kebabs for added flavor and texture. Pine nuts are also delicious in meatballs. Add either nut to meatloaf or kibbe. Dip fish or chicken in beaten egg, then coat with seasoned ground nuts before frying. Even easier: chop pistachios or almonds and season well. Brush white fish fillets (sole, bass, snapper, cod, etc.) with mayonnaise flavored with horseradish and lemon zest or with garlic and fresh herbs. Then sprinkle on the seasoned chopped nuts and bake just until fish begins to flake. Another fish suggestion: gently sauté chopped hazelnuts in brown butter; whisk in a few drops of lemon juice. Pour over freshly cooked fish. 3. Give body to a sauce. Think Fesenjan (Persian duck or meat stew thickened with ground walnuts mixed with pomegranate molasses) or a Spanish romesco-type sauce, adding ground almonds to a purée of tomatoes, red peppers, and so on. Or use ground almonds to replace some of the matzo meal in matzo balls; for a Cajun touch, stir chopped or ground pecans, a bit of cayenne, and chopped green onions into matzo ball batter. Classic pesto recipes call for pine nuts and basil, but you can also substitute other varieties of nuts (such as walnuts, almonds, pistachios) and herbs. Use the pesto on zucchini "pasta" (the vegetable is cut into long "noodles" with a spiralizer before cooking). Stir the pesto into spring vegetable soup or scrambled eggs or fold into a savory matzo brei. 5. Crunch up a Kugel. Instead of pesto, make a simple non-dairy gremolata-type topping: crushed nuts, finely minced garlic, chopped green herbs, and lemon zest. This delivers crunch and a burst of fresh flavor when sprinkled on hot, braised or roasted meats glossed with gravy, kugels, and eggy Sephardi fritadas just before serving . Nuts and vegetables are longtime companions. Gently sauté pine nuts in fine-quality olive oil or butter, add plumped raisins if you'd like, and toss with freshly cooked spinach. Sautéed pine nuts also make a wonderful addition to vegetable fritadas and even savory matzo brei; try adding some to artichoke matzo brei made with thawed frozen artichokes. Hazelnuts or sliced almonds sautéed in butter are other traditional toppers for cooked spring vegetables. For Passover lunches, put aside that same-old matzo and cream cheese sandwich in favor of a flavor-packed Asian-style wrap. Mix cubed or shredded cooked chicken with chopped cashews, scallions and celery; add cilantro sprigs, if you like; moisten the mixture with lemony mayo, spiked, perhaps, with a bit of hot sauce; and serve wrapped in romaine leaves. 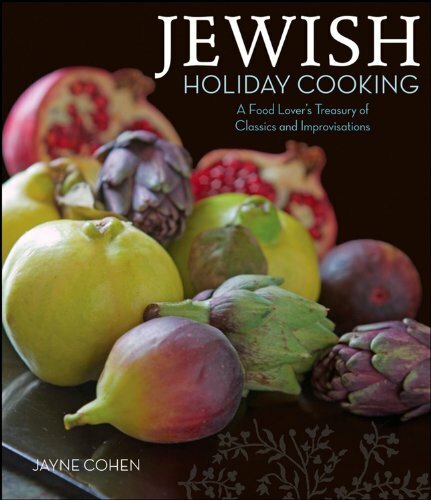 Jayne Cohen writes and lectures extensively on Jewish cuisine and culture. Her most recent book, Jewish Holiday Cooking: A Food Lover’s Treasury of Classics and Improvisations (John Wiley), was named a finalist for a James Beard Foundation award in the international cookbook category.